FNANM distinguishes two varieties, an eastern var. virginia and a Rocky Mountains and west var. demissa (syn: var. melanocarpa) with plants of the high plains showing intergradation between those of the Rockies and those of the East. Based on measured characters used by FNANM of raceme length, petal length, and leaf shape and dimensions, this specimen is closer to var. virginiana, i. e., the eastern variety than it is to the western variety, i. e., var. demissa (syn: var. melanocarpa). North Table Loop, Jefferson County, Colorado: near social trail. Field Notes: Coll. No. 1340, 12 May 2016. 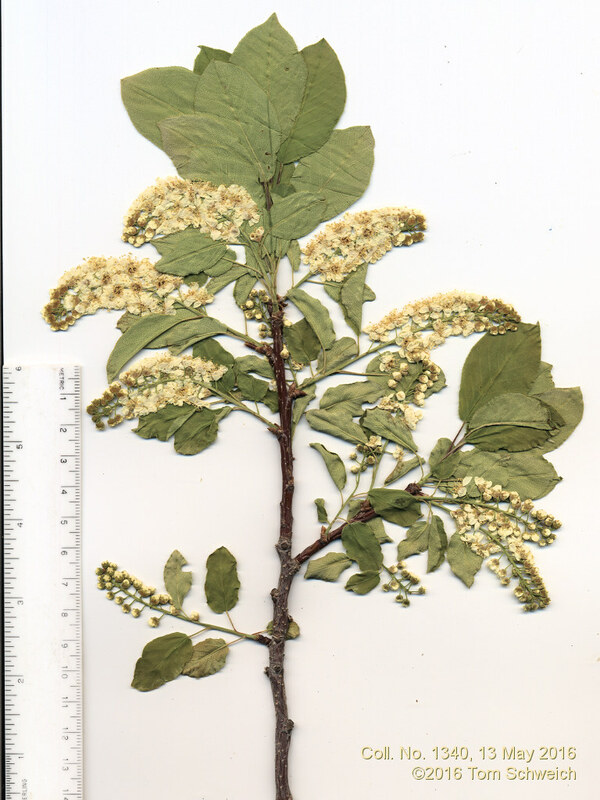 Other photos about Species - Rosaceae or Rosaceae Prunus virginiana.